There are three main ways to replace missing teeth. The first is with removable false teeth – called a denture. Complete or Full Dentures are used if you have no teeth remaining in your jaw. Dr Gill has made and fitted many sets of full dentures, they not only replace the teeth but also all of the supporting gum and bone which shrinks away following tooth loss. A well made and well fitting set of dentures will not only restore function and the ability to eat and speak with confidence, but will also support your mouth, lips and cheeks, the difference can knock years off your appearance. Partial dentures are used when you still have some teeth remaining in your jaw. 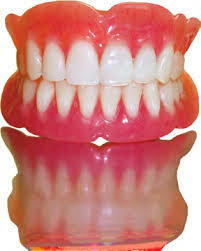 Traditional acrylic or ‘plastic’ dentures – the most common and least expensive type of denture, made of acrylic, they need to be of a certain thickness for strength, and cover as large an area of the mouth as possible to achieve the suction to hold them in place. Metal or cobalt chrome dentures – these dentures are much stronger, they are lighter to wear and can be supported by the remaining teeth making them feel firmer and more fixed in place. Although the base is metal, they have gum-coloured plastic and natural-looking teeth fixed to them. Sunflex dentures- the most exciting development in dentures for decades, the latest flexible plastic materials are used to make a thin, lightweight, virtually unbreakable denture which shares the advantages of metal dentures but is made of all natural-coloured material so is invisible in the mouth. Which type of denture is best for you will depend on the condition of your remaining teeth and gums, in most cases Sunflex dentures will give the best results. For more information on Dentures at Goodall Dental Practice, or to book a free no obligation consultation, call the team on 01922 642621, or click here to send an online request.